A local reno, and a huge win for Sacramento! I had the opportunity to support not only the Firefighter Burn Institute but also check out a recent Sacramento renovation at the long unoccupied Black Angus building which has been brought back to life as Farrell’s! This old and dilapidated building had set vacant for more than 5 years and was quite the eyesore in my neighborhood. I was more than excited to see the renovations taking place over the last few months taking the building from drab to fab! I was there on the opening night and was able to snap a few pics! The business has been open for about a month now and is going strong! Sacramento is happy to welcome Farrell’s back and we thank them immensely for the beautiful renovation which now graces a somewhat lackluster street corner! As the title suggests, sometimes it’s the little things that aren’t so obvious that can make a large impact. Recently I’ve made quite a few big changes to my kitchen however this is one is more for me than anything else! This weekend’s project with HandyDad and HandyBro included changing the cable hookups in my living room, master bedroom, and the kitchen. This allowed me to change around the furniture in the living room and bedroom to better the flow, but the one I’m MOST excited about is the kitchen! 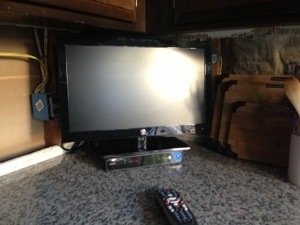 You see, I’ve ALWAYS wanted a tv in my kitchen. My mom has had one for as long as I can remember and it has always made my hours and hours of cooking pass by in an instant! I vowed the minute I bought a house I would give myself the same luxury. And this weekend it was mission accomplished!! On a recent trip to Best buy I found an open box flat screen tv coupled with a $40 reward zone certificate compliments of all my new appliances, and a $50 gift card for a dent on the side of the range the naked eye will never see, and I was able to walk away with a new tv for under $50. Clearly this Renolista likes a good deal, and this wasn’t one I could pass up! I spent 4.5 hours in the kitchen this past Sunday and was able to have my trusty Bravo on keeping me company the entire time! So. Exciting.